Donald Arthur MacLean was born in Toronto, Canada, on 2 April 1916, one of the four children of James and Edith MacLean. His father worked as a foreman at Goodyear Tires in the city. He went to Bloor Collegiate school and the University of Toronto, and then qualified as a teacher. He was a good ice hockey player, and this helped him get teaching positions in the small towns of Head Lake and Powassan in Ontario. 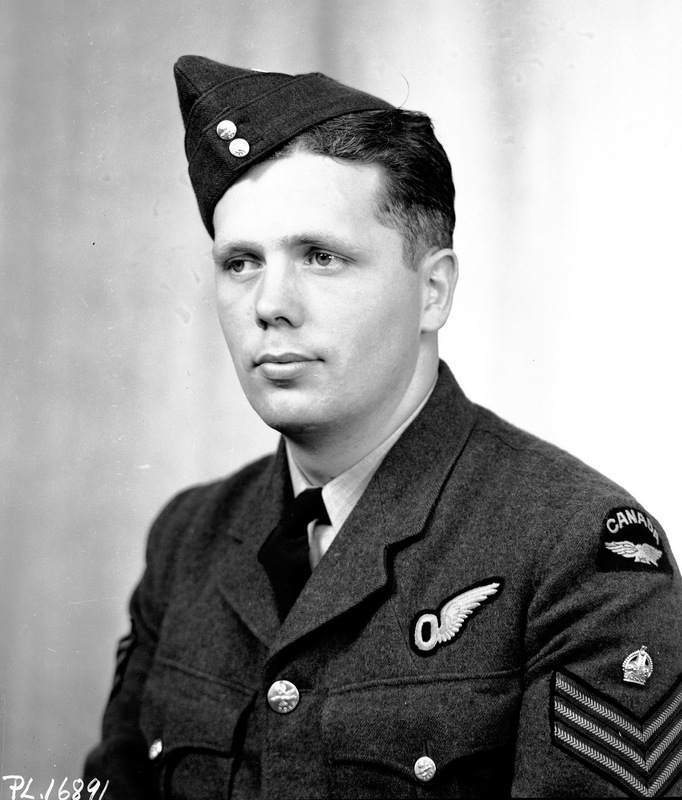 MacLean volunteered for the RCAF shortly after the war started. After qualifying as a navigator, he set out for England. After further training and a short spell in 44 Squadron, he arrived at 97 Squadron at the end of 1942. His first operation was with Flt Lt K G Tew, when they took part in “gardening” on 31 December 1942. MacLean then flew on a further 17 operations over the next three months, all except one with Tew as his pilot. He then transferred to Joe McCarthy’s crew. He may have seen this as a temporary move, since McCarthy and the others were all at the end of their first tour, but when the chance came for a move to a new squadron he went along with it. The easy rapport between McCarthy and his crew would surely have swayed his decision, along with the fact that it already held two other Canadians. Whatever the reason, with MacLean’s arrival, McCarthy’s crew was complete and wouldn’t change again for another 13 months. 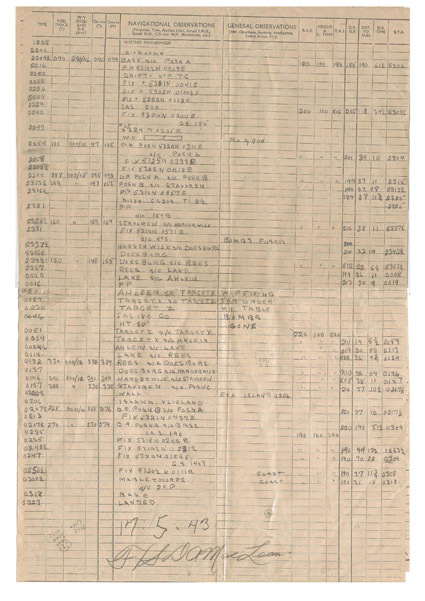 MacLean’s navigation log for the Dams Raid provides an account of AJ-T’s journey, along with some fascinating details. At 0020, before the aircraft reached the target, MacLean wrote: “W.Op fixing TR9 under my table”. He recorded the time of arrival at Target Z as 0030 and at 0046 wrote “Bombs Gone”. If there were nine or ten runs in all, as Johnny Johnson recalls, then this would mean that they took not much more than 90 seconds each time to get back to the starting point. MacLean’s log doesn’t seem to record the fact that AJ-T went off course on the way home, ending up over the heavily defended town of Hamm. Fortunately McCarthy managed to find a way through and the aircraft returned unscathed. The error might have been due to the earlier change in compass deviation cards. MacLean carried on flying with Joe McCarthy throughout the rest of their tour, ending with 57 operations under his belt. He married his wife Josie, who had worked as a wireless operator at Scampton, in Lincoln Cathedral in 1944. She went out to Canada and lived with her parents-in-law until MacLean himself was able to return there later that year. Don MacLean stayed in the RCAF after the war, and eventually retired in 1967 as a Wing Commander. He was stationed in many locations across Canada and the USA but also had a four year stint from 1957 to 1961 on the Canadian Joint Staff in London. The family, which by then included four children, lived in Croydon at that time. After leaving the RCAF, he worked as Director of the Ontario Health Insurance Program(OHIP) in Toronto. He finally retired in 1981 and died in Toronto in July 1992. Survived war. Died July 1992. I believe that the navigation error was the result of the fact that, since 825 had arrived at Scampton only a few hours before the raid, it only had a compass swing with the bomb on board but not without the bomb. Thus once it was dropped there was an immediate deviation error introduced into the magnetic compass and there was no compass card to refer to for this situation.